Republican leaders were scrambling this week to persuade a small number of holdout senators to back the first comprehensive tax overhaul plan in three decades, hoping to send the legislation to President Trump’s desk before Christmas. Like the House GOP’s tax bill, which passed in a 227-205 vote along party lines, the Senate Republicans’ plan slashes the corporate tax rate from 35 percent to 20 percent and nearly doubles the standard deduction for individuals to $12,000. It would also repeal the personal exemption and double the per-child tax credit to $2,000 and the estate-tax exemption to $10 million. Unlike the House bill, the Senate plan keeps the $1 million mortgage interest deduction, completely eliminates state and local tax deductions, and repeals Obamacare’s individual mandate—freeing up to $338 billion to fund bigger but temporary tax cuts for people making $38,701 to $200,000 a year. President Trump called the plan a “beautiful Christmas present” for the American people. An analysis by the nonpartisan Tax Policy Center found the bill would result in a tax hike for about 9 percent of taxpayers in 2019—increasing to 12 percent in 2025 and 50 percent in 2027. 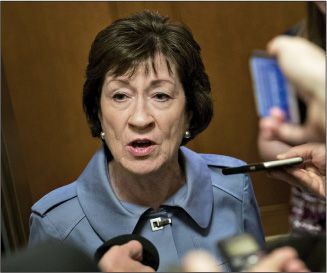 Deficit hawks expressed concern over the bill’s cost, estimated at $1.4 trillion in lost tax revenues over the next decade, while Sen. Susan Collins (R-Maine) called the repeal of the individual mandate the “biggest mistake” in the legislation. Sen. Ron Johnson (R-Wis.) came out against the plan, saying it favored large corporations over small businesses and was the product of an “awful, rushed” legislative process. “That’s not the best way to pass something that’s going to affect so many people’s lives,” Johnson said. This bill would “make Scrooge McDuck proud,” said The New York Times. Congress’ own Joint Committee on Taxation says that, if the Senate plan is implemented, millionaires would enjoy average tax cuts of $5,580 by 2027, while “families earning less than $75,000 a year would pay more taxes.” As if that wasn’t miserly enough, the bill’s repeal of the individual mandate will leave 13 million more people without health insurance. All this so that big business and mega-wealthy GOP donors can keep more of their riches. “America badly needs corporate tax reform,” said David Frum in TheAtlantic.com. But this isn’t it. The corporate share of the federal tax burden has dwindled to 10 percent, down from a third in the 1950s, thanks to myriad loopholes that would remain under the Republican proposal. Instead of pursuing broadly popular changes—like cutting the corporate tax rate to 25 percent in return for ensuring that’s the rate corporations actually pay—the GOP seems determined to throw donors “as much as it can, as fast as it can.” The result? A 20 percent rate that will balloon the deficit, force tax hikes on some middle-class Americans, and be overturned the minute Democrats regain power.